Russell Westbrook believes the Oklahoma City Thunder are the best team in the NBA when they defend like they did against the Los Angeles Clippers. 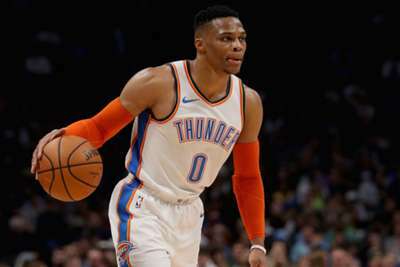 The Thunder claimed a 110-104 victory over the Clippers, with Westbrook's defensive energy pivotal as Oklahoma City prevailed just a day after losing to the Denver Nuggets. Westbrook only had 13 points, nine rebounds and 12 assists, but he was unconcerned by his underwhelming offensive showing. "When we defend like that — best team in the league," Westbrook said. "We know what we have to do to win games." Thunder coach Billy Donovan was full of praise for Westbrook's all-action defensive showing, saying: "We need him pushing the ball with pace. We need him playing defense at a really, really high level. "When he does all the things that he did tonight, regardless of how he's shooting, I think his fingerprints are always all over the game." Though back-to-back games are often a bone of contention among NBA players, Thunder star Paul George believes being on a second night of one helped the Thunder on Saturday. "I think we get the best out of ourselves [on a back-to-back] because we know we can't mess around," George explained. "We know we need every little bit of energy. We know we're the team that's disadvantaged in a way, because the other team is fresher. I think it heightens our alertness and it forces us to play up to a certain standard."